Benthic respiration is the integrative measure of stream metabolism and C utilization from all sources. It includes respiration by primary producers, microbial heterotrophs, and animals, which as mentioned earlier can be visualized as RA of autotrophs and RH of heterotrophs. Respiration by microorganisms often is the largest component of RH, reflecting the important roles of bacteria and fungi in the breakdown of organic matter and their ability to utilize labile DOM from streamwater. 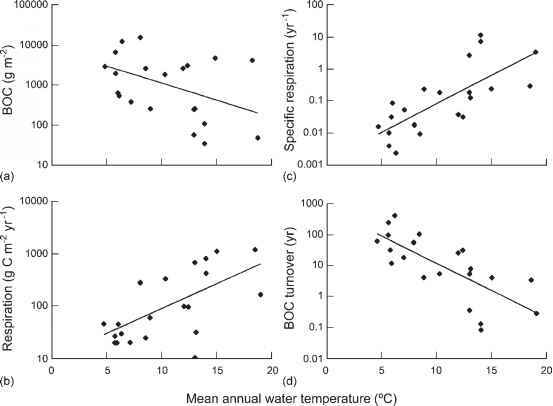 Because metabolic processes are strongly temperature dependent, respiration is expected to vary with temperature, as Bott et al. (1984) reported for streams in Michigan and Pennsylvania, and in general to be strongly seasonal. Total respiration should increase with increasing amounts of benthic organic matter (BOM), but the quality of BOM is at least as important as quantity (Findlay et al. 1986a). In a Tennessee woodland stream, respiration was highest in early spring due to high GPP and infall after leaf input, which are periods of moderate temperature, and low during the warmer midsummer period because of low organic matter supplies (Roberts et al. 2007). A downstream increase in benthic respiration might be expected if total C inputs increase, because warmer temperatures stimulate higher rates, or because larger rivers receive greater inputs from domestic sewage or agricultural runoff. Due to the scarcity of data for large rivers, changes in R with increasing river size are poorly documented. However, downstream increases in R have been reported in systems as disparate as the highly autotrophic Salmon River (Minshall et al. 1992) and highly heterotrophic blackwater rivers in Georgia (Meyer and Edwards 1990). warmer climates. The mean respiration rate of 265 g C m2 year1 calculated from the data set analyzed by Sinsabaugh et al. (1997) was considerably lower than the average of 739 g C m 2 year1 calculated by Webster et al. 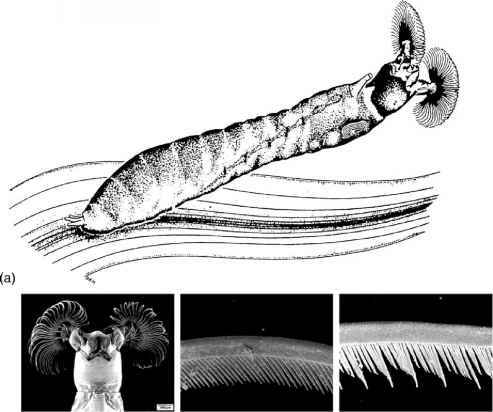 (1995) from 61 streams of the eastern deciduous biome of the United States. Differences may be partly attributable to methods and partly to stream type and climate. Neither synthesis found a clear influence of stream order, and it may be that longitudinal studies of a single system rather than cross-system comparisons of streams are better suited to the investigation of downstream trends.